My late mother's favourite colour was red whether it was a lipstick, nail polish or dress. 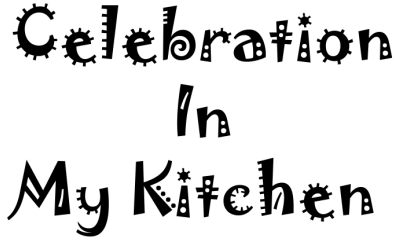 On her birth date (May 19), I wanted to prepare something vibrant, beautiful and delicious. A memorable day for the family with my brother's wedding anniversary on the same day. I was excited about the royal wedding too, which can be seen in the presentation. 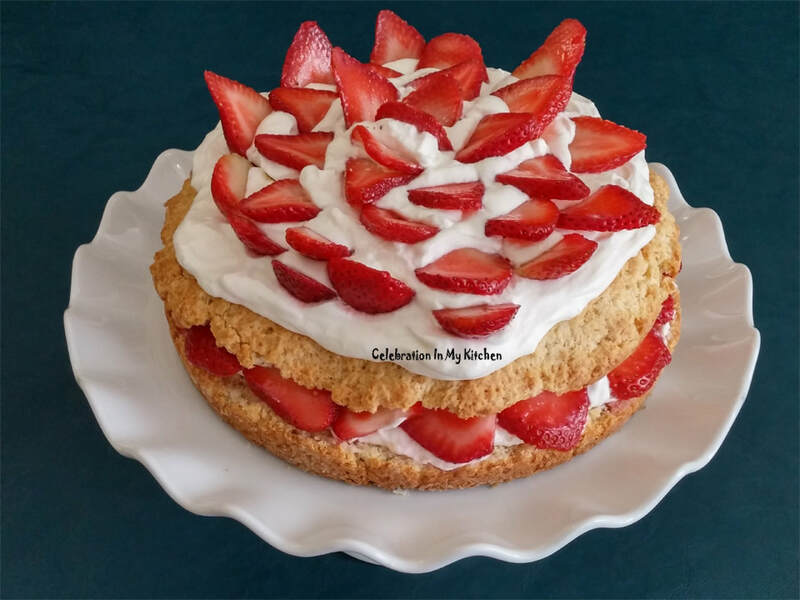 With strawberries in the refrigerator, the first thing that came to mind was the popular shortcake. 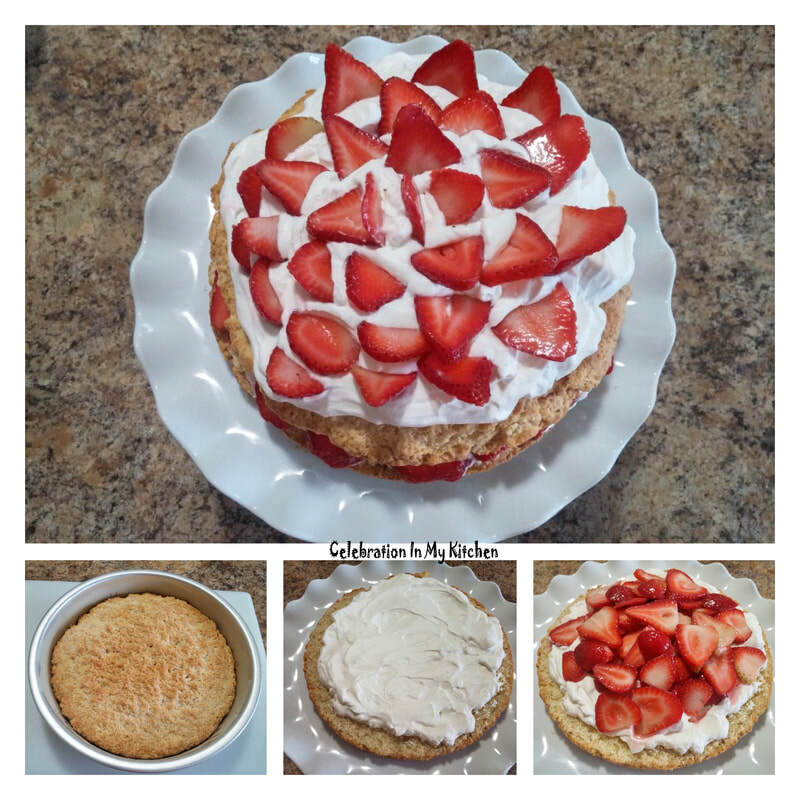 An easy and refreshing summertime dessert made with either a biscuit or sponge cake base. Strawberries are washed, dried, hulled, sliced and left to macerate with sugar for an hour. The macerating helps the strawberries to release some of its moisture resulting in a flavourful syrup. Cubes of cold butter are cut into the dry ingredients; flour, sugar and baking powder until the mixture resembles coarse crumbs. Then, the wet ingredients; milk, egg and vanilla extract are incorporated until just moistened to create a shortened dough. Transferred into a cake pan and baked at 350 F or 180 C for 25 minutes. Cooled, cut horizontally into half, filled with whipped cream and strawberries. Covered with the top half of the cake and finished with more cream and berries. 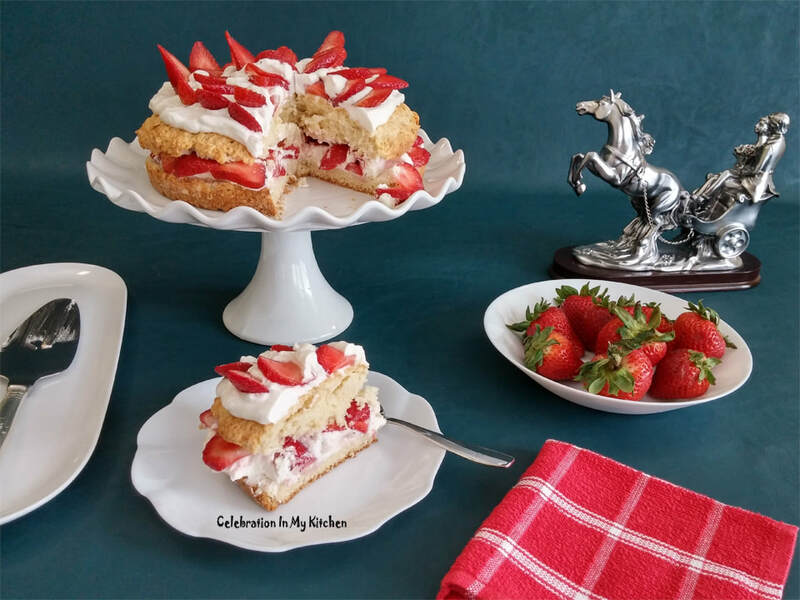 Perfectly sweet with a crumbly texture like a scone, highlighting the strawberries, a visual treat and tempting. 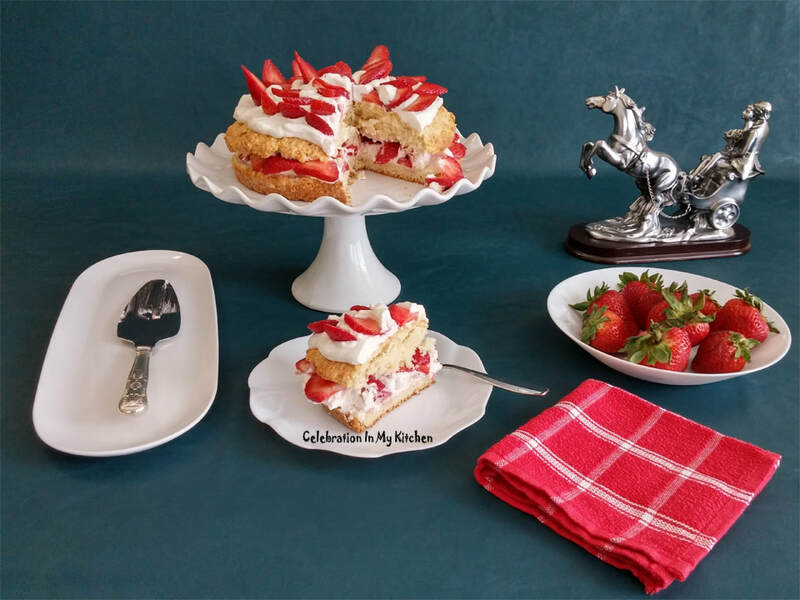 The most famous dessert made with shortcake is strawberry shortcake. 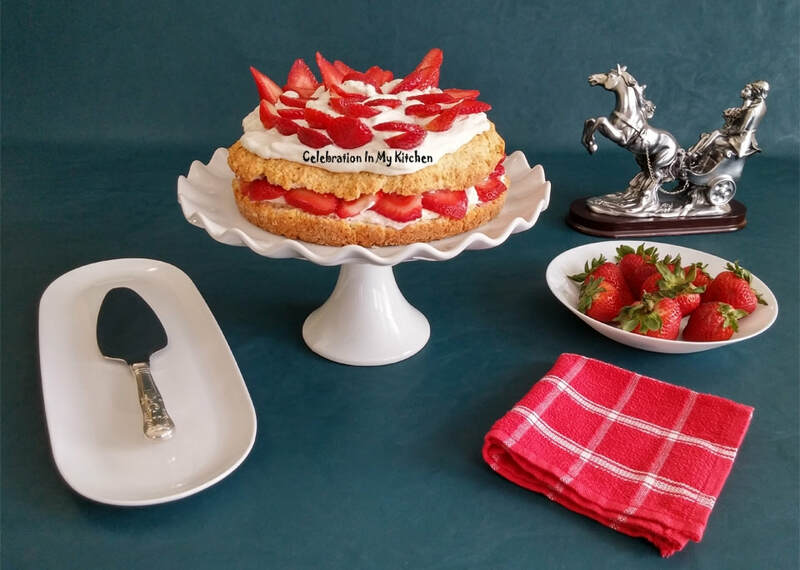 June 14 is National Strawberry Shortcake Day. Just bake a shortcake and enjoy. 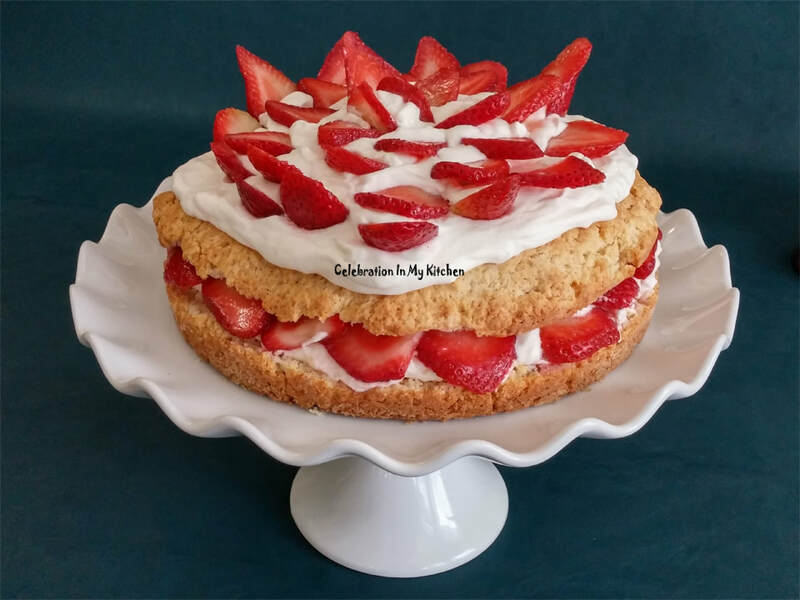 Japanese strawberry shortcakes use a sponge cake base. Popular in Japan especially for Christmas. The strawberry is the only fruit that has the seeds on the outside. An average strawberry is adorned with 200 seeds. Not a true berry because the seeds are on the outside with botanists confirming that each of the seeds could be considered as a separate fruit. The strawberry plant is a perennial that come back year after year. Wash, pat dry and hull the strawberries before slicing. Transfer to a bowl, mix the sugar and set aside to macerate for an hour. Grease and flour an 8-inch cake pan. Set aside. 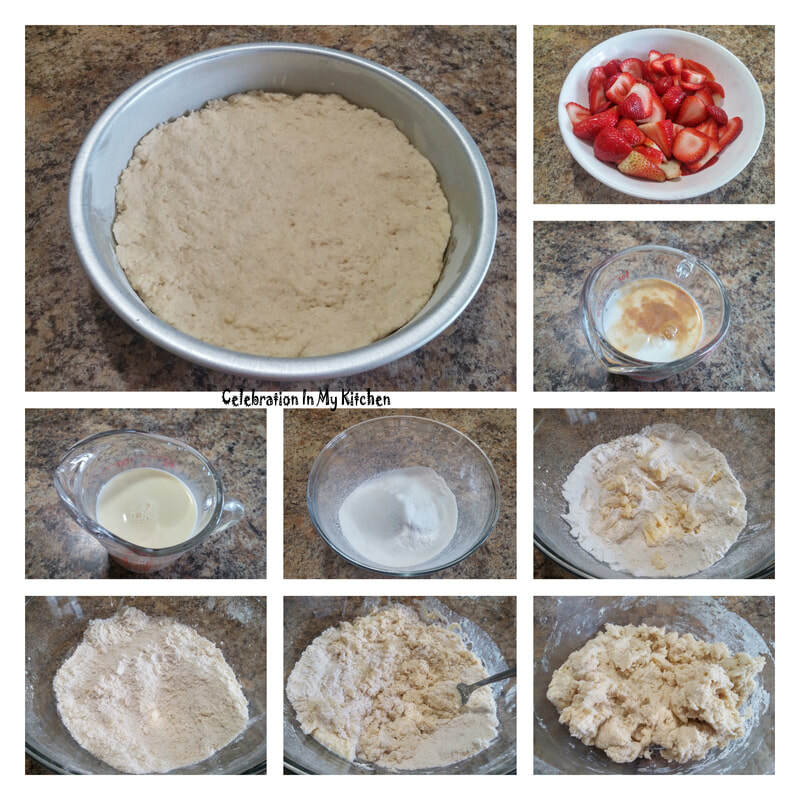 Sift the flour and baking powder in a bowl. Mix in the sugar and using a pastry blender, cut the cubes of butter until they resemble coarse crumbs. Separately whisk the egg, milk and vanilla extract together with a fork. Add to the flour mixture until the dough comes together and wet. Transfer to the prepared pan and spread towards the edges. Bake for 20 to 25 minutes until golden brown and cake tester or toothpick inserted in the centre comes out clean. Cool for five minutes and then remove from pan onto a cooling rack. The same batter can be used to prepare smaller individual shortcakes. Drop 8 mounds of dough inches apart onto a greased baking sheet. Bake at 350 F or 180 C for 12 to 15 minutes or until golden. If using unsalted butter, add 1/8 teaspoon of salt. Vanilla sugar can be substituted with confectioner's sugar and 1/4 teaspoon vanilla extract. Cut the cake horizontally into two halves. 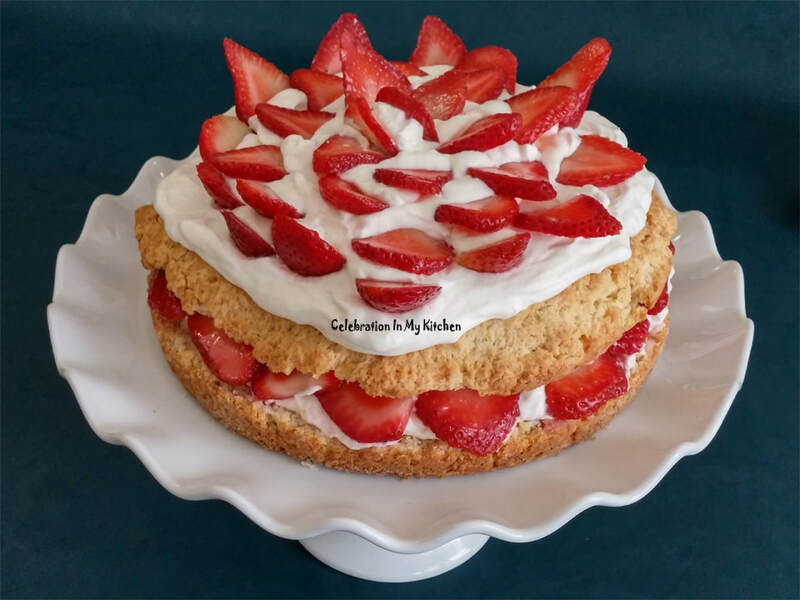 Put dollops of whipped cream on the bottom layer covered with half of the strawberries. Cover with the top layer of the cake, followed by whipped cream and finally, decorate with the remaining strawberries. Slice into wedges and serve drizzled with the flavourful liquid released by the strawberries. The bottom layer of the cake can be brushed with the flavourful liquid if served right away. I did not to prevent the cake from getting soggy since I had to click pictures for the post. Cake is very easy to make and absolutely delicious.